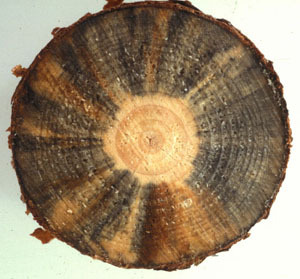 When trees are cut fungi can rapidly colonize the sapwood and cause a dark stain. This stain often appears blue or black and reduces the quality of the wood. Blue stain in pine and other coniferous woods is very common but dark stains also form in hardwoods like maple, birch and beech. The aggressive sapstaining fungi that cause the stain are very difficult to control and in the past chemicals such as pentachlorophenol have been used to protect cut wood surfaces from stain. Our research has focused on a new approach to controlling sapstain using biological control. Naturally occurring albino strains of Ophiostoma are being tested to control dark staining fungi. 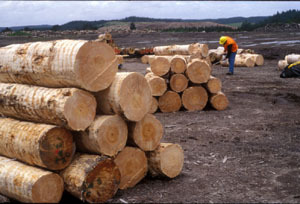 The biocontrol agent is applied immediately after cutting and as it grows in the wood it captures nutrient resources that stain fungi normally use. 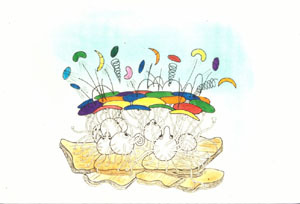 Since the fungus is colorless, there is no stain caused by the biocontrol agent. Once established, the albino strain effectively prevents subsequent colonization by fungi that cause dark stains in wood. Field testing is underway in New Zealand (in cooperation with Professor Roberta Farrell, University of Waikato, Hamilton, New Zealand) and in Chile (in cooperation with Professor Jose Navarrete, University of Bio-Bio, Conception, Chile) using Pinus radiata. This tree grows very fast in these countries and consists mostly of sapwood which is severely affected by blue stain fungi. 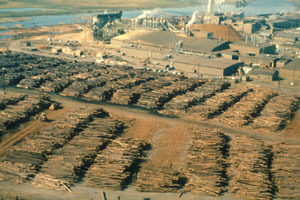 Pioneer colonizing white rot fungi are also being used as biological control agents to prevent stain in wood used for pulp and paper production. Fungi such as Phlebiopsis gigantea (previously called Peniophora gigantea) have been used to treat pulpwood during shipping and storage. 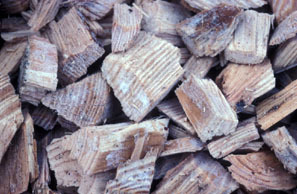 The treatment prevents stain fungi and causes beneficial changes in the wood that helps to facilitate the pulping process (such as reduced energy use during mechanical pulp production and improved paper qualities). Fungi, such as the albino strains used for biocontrol, out compete wild type fungi that cause dark stains and prevent them from colonizing the wood. ©2003 - 2006 Robert A. Blanchette. All Rights Reserved.